» Dave Clark Path: And after dark? Dave Clark Path: And after dark? I’m not sure how much traffic there is on Albany’s Dave Clark Path along the Willamette River after dark, but whatever there is it might soon benefit from a little more light. Not necessarily from this thing, though. On the eastern end of the riverside path, lack of lighting has come up a few times in city meetings, most recently on Monday when the city council heard a presentation on “crime prevention through environmental design.” Sandy Roberts, a community education specialist with the Albany police, said the proper kind of lighting can have a big effect on the perception and reality of public safety in particular places. The right kind of lights in parks and other places, such as this path, shine light straight down, making things and people visible, rather than causing glare that makes it nearly impossible to see anything. 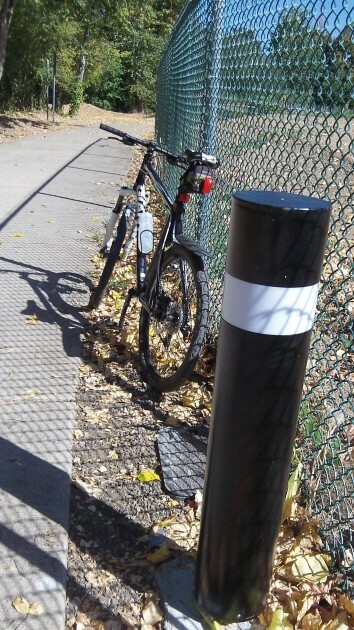 The bollards were put in by Edgewater and are independent of a plan to add proper lighting to the path. A request to have the city put in lights is being prepared for submittal to the advisory board of CARA, the Central Albany Revitalization Area. Steps to encourage greater public use of the path, while discouraging transients from camping along it, have already been taken. Vegetation has been thinned so path users can actually see the river and enjoy the view, and spots popular with vagrants have been posted as closed to the public. Better lighting is supposed to be the next step. My wife loves the Dave Clark riverwalk but I will not let her walk there after dark precisely because of the transient problem on the east end near my home. From the Wheelhouse east, that is no place for any woman to be walking alone at night under any circumstance in my opinion. Lighting would help that situation considerably but we use that path often and I have seen plenty of undesirable activity and people during daylight hours so I doubt lighting alone would solve the problem. There just is too much opportunity down there for people of ill will to mdo what they do, given the opportunity. The housing development and the people that will come with it will add the most to the safety of the area.